We own two couches. 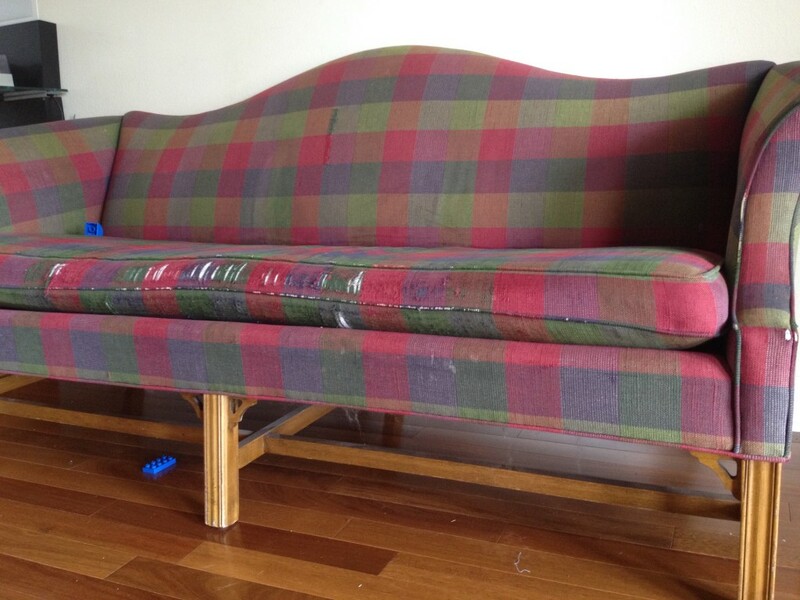 One of them, a red and green plaid couch that almost looks fancy, David found in a dumpster about 9 years ago. I was tired of it back when we first were married, tired of how it looked and also how it was starting to rip and was already sewn back together in the middle from when he first pulled it out of that dumpster. When I was taking the couch apart to throw it away, I saw a silk tag sewn underneath the cushion: Ethan Allen. I’m not usually aware of which furniture is better than others, but my friend owned a few Ethan Allen pieces because her mother-in-law used to work there, and had just spent close to $1000 re-upholstering her own old-ish couch to preserve the good craftsmanship. With fresh appreciation for the ugly couch, I decided it could stay. Instead I threw away a falling-apart faux leather couch with an unknown designer. 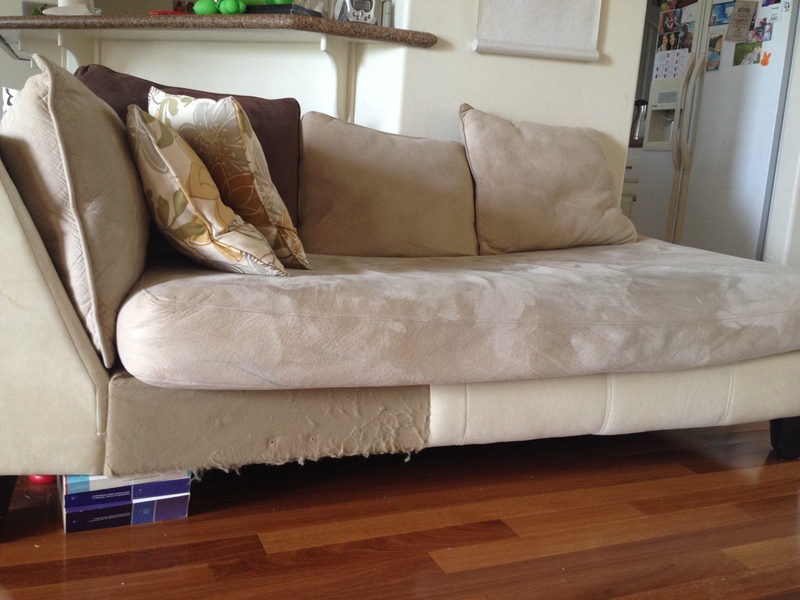 The second couch in our living room was found on Craigslist, to replace the faux leather one. An Asian grad student listed it that morning for $50. He was finished with his master’s at Michigan State and moving to Colorado for a doctorate in some higher math. Although his English wasn’t as good as his math, he helped us carry the couch down the stairs from his second story apartment. He even offered to throw in a floral-print stuffed chair which we had the presence of mind to decline–it would never match our plaid Ethan Allen (nothing ever does). We strapped that $50 couch to the roof of our Thunderbird and drove away like we’d just won something. We finally had a nice-ish place to sit and hold our future babies. That was four years ago this summer. We moved from Michigan to Texas, moved those two couches with us. We’ve held lots of babies on them, had lots of Bible studies on them, taken lots of naps on them. The tan couch has blue crayon on it right now since Sarala colored there immediately after I washed out the marker she drew on before. A leather couch. A nice leather couch whose previous residence was a mansion. I’ve been thinking about this couch now for days. I’ve never seen it, but I can’t stop imagining how perfect it would’ve been to sit in. How I would’ve finally parted with the Ethan Allen that matches nothing. How our living room would maybe finally look put-together, like someone put things there on purpose. Jesus said this a long time ago, and also this week, to me. He said it to me about this couch, and also about so many things I’ve wrapped my heart around. Some of them are real, like my nice dishes and expensive double stroller. Lots of them are imaginary, like my leather couch, like living near all of my friends and their kids and our kids all going to each other’s birthday parties and then someday marrying each other and all of us sharing one easy lifetime on a quiet cul-de-sac. The thing is, we are planning to move our little family to another country. Planning to pack things in suitcases and boxes so we can live with the marginalized and share holidays with them, share Jesus with them. Couches don’t fit in suitcases. I know this. My dreams of a quiet cul-de-sac don’t fit in that future. And my treasure, though I try to store it in heaven, is sometimes (lots of times) tightly clenched in my fists, here where moths and rust (and can I add: children?) destroy. So today, I’m thinking as I sit on my ripped couch about treasure and heaven. About how I can let that leather couch go . It was never mine anyway. None of this ever was.